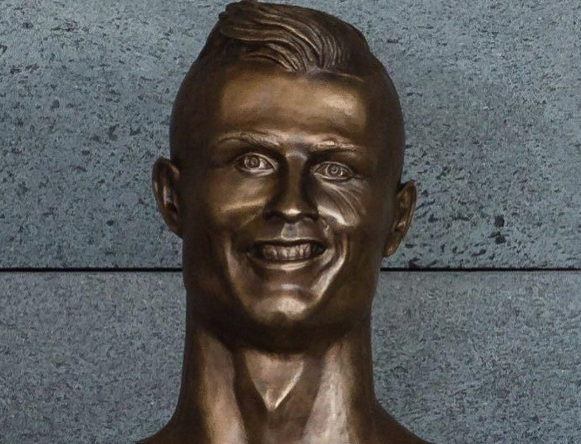 Audible gasps of horror could be heard from the crowd at yesterday’s unveiling of a new Cristiano Ronaldo statue in Madeira. The bronze bust was revealed during a ceremony to name the Portuguese island’s airport in honor of its handsome, 32-year-old hometown hero. The problem was–well–you can see for yourselves. Within minutes of the unveiling the internet was in a tizzy, and not in a good way. The international response has been pretty universal: Nobody thinks it looks like Cristiano, most people find the bust somewhat bothersome, and everyone feels sorry for him. Seriously, how could you not? You know that moment when you feel embarrassed for somebody else? This is so fun. I love humans. The artist needs to stop doing so much acid. At first I thought “oh gawd more click-bait”. Then I looked and beheld the horror! Kinda like the Lucille Ball bronze in Palm Springs. Very tricky, bronze.